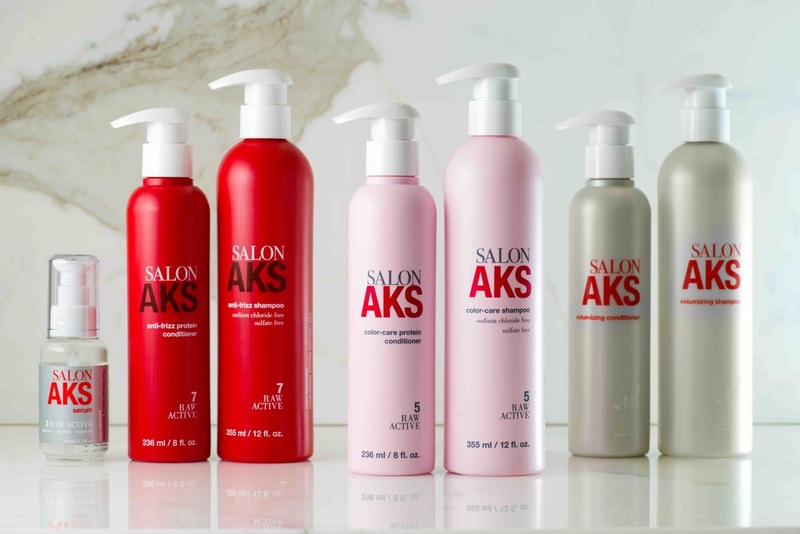 Salon AKS Launches New Line of Hair Products! The colorful range of shampoos and conditioning treatments, plus their star AKS serum, was created from many years of experience working with their clients hair care needs. It took eight years of research and development to formulate this exclusive line. Butter to create a protective barrier, seal in moisture to leave hair instensely hydrated. Keratin and Sunflower actively bonds to hair and keeps frizz at bay, strengthens and imparts shine. Amino Acids and Wheat Protein promotes healthy hair growth, strengthens and repairs the hair cuticle. AKS Volumizing Shampoo ($23) and Conditioner ($21): The “3 Raw Active” formula is designed to amplify volume, by gently cleansing and hydrating hair. The Shampoo features Coconut Water for intense hydration, Chamomile Extract which repairs and promotes a balanced and soothed scalp and Sunflower extract which provides shine and antioxidants. The conditioner features Aloe Extract for strenghtening, Wheat Protein for retaining moisture and Sunflower Extract for volume and shine. AKS Color Care Shampoo ($26) and Conditioner ($24): Both contain “5 Raw Active” ingredients designed to illuminate, retain and protect hair color. The Shampoo and Conditioner both contain Coconut Water for intense hydration, Macadamia Extract for moistuization, Rosemary leaf for color protection and Meadow Quat for color durability. AKS Baby Toddler Hair and Body Wash ($20) Natural & Tearless, Sulfate Free and Fragrance Free: The “4 Raw active” fragrance free formula is designed to gently cleanse your baby’s hair and skin. Formulated with all natural ingredients, so it’s also gentle on the eyes. The hair and body wash contains Coconut water for hydration, Sunflower Extract for luster, Wheat Protein for skin moisture and Chamomile Extract for relaxation. AKS Serum ($27): The serum is a lightweight yet high performance leave-in serum for all hair types smoothes and imparts shine without weighing hair down. The serum's '3 Raw Active' formula include Vitamin E for protection, Keratin for protein replacement, Argan Oil to hydrate. ​The luxurious Salon AKS product line has natural ingredients and promotes healthy hair. The Salon AKS line is now available at Salon AKS 689 Fifth Avenue, 10th floor New York City, and at www.shopaks.com!